The Dynamo run comes once a year to the lost city of Dunwich near my home. 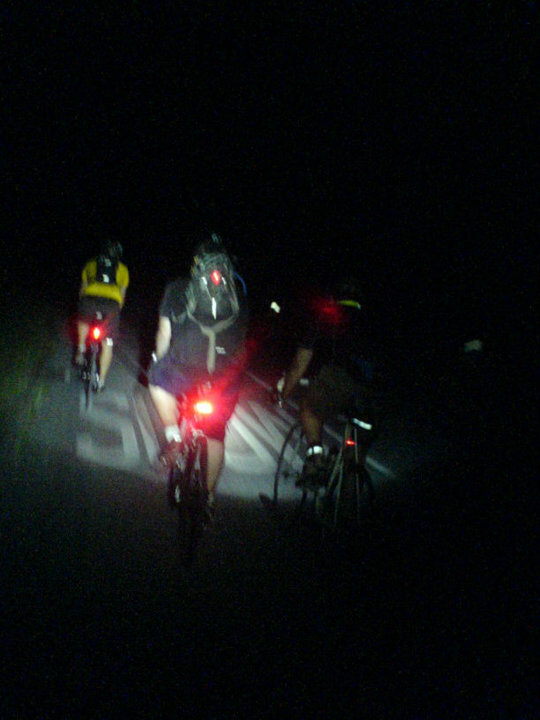 On the Saturday nearest the full moon in July a friendly invasion of up 1500 cyclists rides through the night from the elysian fields of Hackney collapsing 120 miles later into the pebble beach of a tiny fishing village lying between the resort towns of Aldeburgh and Southwold. Its beauty is that it is unorganised. It's not a race, there's no start time, there's no corporate sponsors (yet). People just turn up and like a flock of starlings, suddenly it's time to go. Along the way riders share food and drink, help each other with technical problems and encouragement. The only organisation is by the Southwark Cycle Club who book coaches and furniture vans to bring riders and their steeds home. Others rely on being met by friends and WAGs or try their luck with the trains from Darsham. A feed stop in a village hall around the half-way point is also organised, the location varies year to year. In 2010, riders reported that an 'unofficial' but welcome bacon roll stall was set up in a front garden 50km from the finish which raised hundreds of pounds for the East Anglian Air Ambulance. I plan to do it next year. Hopefully its growing legend - thanks to social media - won't spoil it by then. Perhaps I might in the spirit of Halesworth's Bike Aid be generous and offer my orchard for camping (and it's very convenient to Halesworth train station). But until the night of 16/17 July 2011, I'll read the words of those who have already done it with admiration and just a touch of envy.